It has been two years since I started this blog in July 2003. 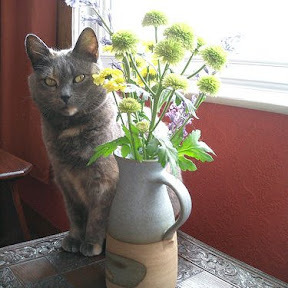 Regular readers here will know the title of this blog puts my current situation in a nutshell as it includes the illness (ME) I have suffered since October 1999 and names my constant companion, Ophelia, the sweetest, most well behaved cat who likes to play and never puts a foot wrong. Things are looking up. For the first time since ME was identified some 50-70 years ago, news is starting to emerge of a possible breakthrough in research which could lead to a diagnostic tool and treatment. It may take a few years or more for any treatment to become a reality but considering there has not been a single thing that helps this illness, apart from complete rest which turns ones life into a living death, this news is a major milestone. As I've still not walked beyond my front gate since March 2003 it's hard to remember what it is like to be well. Thinking of what it feels like sitting up for more than ten minutes and being up and out and about, walking and talking, free of pain and enjoying the company of people and having fun is a memory, like something from my childhood, that seems blurred and too far in the distant past to recall exactly. This morning, a dear friend emailed me an article about ME by Nic Fleming, Medical Correspondent, The Daily Telegraph, UK (Filed: 21/07/2005) - along with two letters to the Editor. The first letter says it all. There are no ME sufferers who would not agree with every word of the letter. Disbelief, the worst aspect of this illness, results in a lack of practical help and support and adds more grief in the battle against pain, isolation and loneliness. The belief that chronic fatigue syndrome is "all in the mind" may finally have been laid to rest with the discovery that sufferers have biological abnormalities, researchers claim today. The illness makes sufferers feel exhausted. The symptoms, which include weakness, headaches, disrupted sleep patterns and a difficulty in concentrating, have been likened to a bad hangover. A team led by Dr Jonathan Kerr, from Imperial College London, has made a breakthrough in research on the illness, which could lead to a blood test for the disorder and drugs to treat it. The research, due to be published in the Journal of Clinical Pathology next month, shows "clear physical changes" in fatigue syndrome sufferers. Dr Kerr's team discovered that their white blood cells behaved differently from the cells of non-sufferers. Several cell genes seem to show signs that continuing viral infection is the cause of the condition. There are between 120,000 and 250,000 sufferers in Britain. The syndrome has been designated a neurological condition by the World Health Organisation. Also known as ME, it has confused scientists for years, with some clinicians dismissing it as a figment of the patients' imagination. Dr Kerr and his team now intend to examine a larger sample of sufferers. He said: "The involvement of such genes does seem to fit with the fact that these patients lack energy and suffer fatigue. This research will open the door to development of pharmacological interventions." Russell Lane, a neurologist at Charing Cross Hospital in London, said: "This exciting new work shows that some aspects of this complex illness may be understandable in molecular terms and that chronic fatigue syndrome is not a 'made up' illness." Dr John Gow, a senior lecturer in clinical neuroscience at the University of Glasgow, is carrying out similar work, using DNA micro-analysis to examine differences in active and inactive genes in sufferers. His preliminary findings support those of Dr Kerr's group. Dr Gow's group has identified certain drugs that it hopes to put through trials to see if they can be used to treat fatigue syndrome. Dr Charles Shepherd, a medical adviser to the ME Association, said: "This work is very significant. It gives us clues about genetic abnormalities that can guide new research into the causal mechanism of the condition, which hopefully can lead us to novel treatments." Sir - Having suffered from this appalling and extremely debilitating multi-faceted condition for over 35 years, I have always been convinced that ME has physical causes rather than mental (News, July 21). However, a major part of my suffering has been the bewilderment engendered by the condescending attitude of the numerous consultants and doctors I have attended over many years. How much more helpful it would have been if the medical profession had simply admitted they did not know the causes of my symptoms but had offered to support me. Sir - The real scandal is the fact that there has been no government funding into the underlying physical cause of an illness that costs the nation around £3.5 billion per year. Even after calls for research proposals from the Medical Research Council, submissions continue to be turned down. The time has come for government to invest some serious money into finding the cause of an illness that has been neglected for far too long.